Malinalco lies at the heart of Mesoamerica’s legendary history, but with the ancient ceremonial centre having been dismantled by Augustinian monks and used to build the incredible Monastery of the Divino Salvador, and with the residential areas lost beneath the modern town, it is very hard to find evidence to support the legends. However, archaeology on the Cerros de los Idolos (Hill of Idols), and in particular the Aztec site of Cuauhtinchan, has provided a glimpse of Malinalco’s historical importance. The earliest hint of a historical record is through the legendary founding of Culhuacan by the Toltec in 670AD. This legend states that in the 140 years that followed, the Toltec city subjugated six nearby kingdoms, one of which is listed as Malinalco. 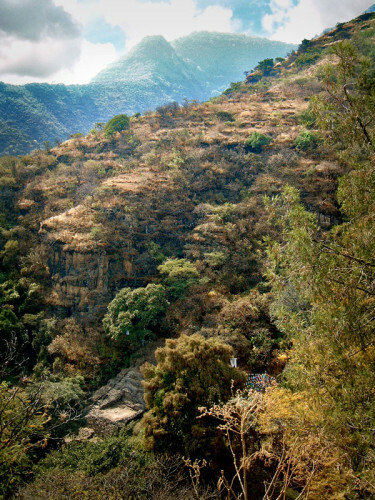 To support this legend, there is an older site upon the summit of the Cerros de los Idolos that appears to date from a much earlier time and José Hernández Rivero’s excavations during 1987-1988 did uncover artefacts that date from the Epiclassic Period, between 750-900AD, which included a vase featuring the god Xipe Totec, and a censer. Another legend states that a Chichimec Lord named Xólotl arrived in the Toluca Valley in 1224AD and defeated Culhuacan before continuing to conquer all before him as he swept from coast to coast. The interesting part of this legend is that upon defeating each town he would climb to the highest point and mark his new territory by burning malinalli grass and firing an arrow in each direction. Malinalco is expressly listed as one of the places that Xólotl performed this act and the name Malinalco takes its name from the malinalli grass, which supports this legend. Further legendary accounts embed Malinalco at the heart kingship in the entire region by stating that Huehue Teçoçomoctli, the founder of Azcapotzalco, was the grandson of a Malinalco nobleman. He is said to have then married a Malinalco noblewoman and their ten children went on to either rule, or marry the ruler of, the cities of Culhuacan, Coyoacan, Tlatelolco, Atlacuihuayan, Aculman and Tlacopan. By the time the Aztec empire was founded, the majority of cities in the region would have had a heritage that descended from Malinalco, which would have made it a very important place. The Aztec were very keen to associate themselves with the ancestral rulers of the Valley of Mexico and assimilated many of the traditions of each area as they stretched their empire over the whole of Central Mexico. It is therefore of little surprise that Malinalco features prominently in the legendary founding of Tenochtitlan, the Aztec capital. The legend begins at the fabled cave dwelling known as Chicomoztoc, where the Mexica (who were the prominent force in the Aztec triple alliance) were one of seven tribes to exodus to the south. The Mexica were led by their founding father, tutelary god and war hero, Huitzilopochtli, and his powerful sister, Malinalxochitl. Unfortunately, Malinalxochitl did not share Huitzilopochtli’s dedication to honourable warfare and instead used her supernatural powers to overcome their enemies. W0119CA: Mexican Coat of ArmsHuitzilopochtli ordered that they abandon her one evening whilst she slept and Malinalxochitl awoke to find only her followers left. They chose to settle at nearby Malinalco where Malinalxochitl married the ruler and immediately gave birth to a son called Copil. Once Copil had grown to become a powerful warrior, Malinalxochitl told him how she had been abandoned by her brother and the Mexica poeple. Copil vowed to take revenge and attacked the Mexica settlement at Chapultapec. Aided by supernatural powers inherited from his mother, he made easy work of the Mexica army and retreated to a hill called Tepetzinco to watch the victorious proceedings. However, Huitzilopochtli spotted this and despatched his soldiers to kill Copil, which they did with surprising ease. The Mexica soldiers beheaded Copil and threw his heart amongst the reeds in lake Acopilco from which a cactus plant grew with fruit that looked like hearts. It was on this cactus that the Mexica saw the prophesied vision of an eagle with a serpent in its beak that marked their final destination after years of wandering and where they would build their imperious city of Tenochtitlan. 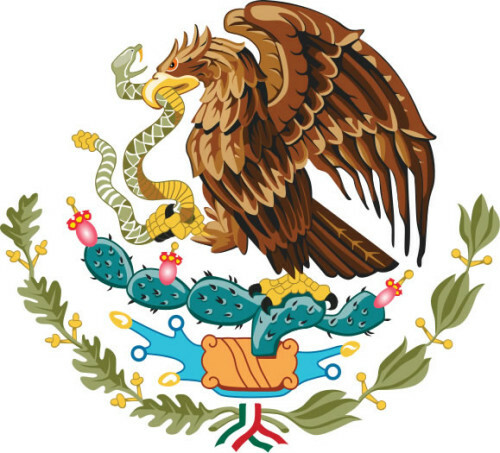 This vision is recorded in modern times by the Mexican coat-of-arms which features on the National Flag (fig. W0119CA). The Malinalca’s own legendary history begins alongside the Mexica in the exodus from Chicomoztoc, in the year 1 Ácatl, which equates to around 1051AD. They travelled for 13 years before arriving at Quetzaltépec where the groups split. The Malinalca continued onwards led by Citlalcóhuatl with several other groups, whilst the Mexica stayed behind. At this time, Malinalco was almost certainly in the hands of the Matlatzinca whose territories surrounded Malinalco when the Aztec later conquered the region. Curiously, Malinalco is not listed in the Aztec accounts of their conquests and whilst it is most likely that Malinalco was absorbed into the Empire along with Ocuilan and the Matlazinca, during the reign of Axayacatl (1473-1484AD), the Aztec accounts do not include Malinalco as a town that they conquered. There are two possibilities as to why this may be: firstly, Aztec legend said that they had already defeated the Malinalca when Huitzilopochtli and his army defeated Copil; secondly, the Malinalca were quite happy to receive protection from their cousins in a territory where they were surrounded by the Matlatzinca. Either way, Malinalco is recorded as providing goods for Axayacatl’s successor, Emperor Tizoc, and was therefore an active town and part of the Empire. By 1486AD, Malinalco was at the heart of the Aztec Empire and Malinalco warriors are recorded as assisting Emperor Ahuitzotl as he marched into Chiapas to quell a rebellion and collect slaves for his coronation. In 1487AD, Malinalco is recorded as supplying slaves to Emperor Ahuitzotl to be sacrificed during the rededication ceremony for the Templo Mayor at the heart of the Aztec capital, Tenochtitlan. Malinalco is featured in the Codex Mendoza, which lists the tributes paid to the Aztec Empire by each vassal or subjugated polity, however Malinalco paid relatively little, which again suggests that Malinalco were very close to the Aztec. This is supported by reports that Moctezuma II would specifically draw upon sorcerers and soothsayers from Malinalco. Moctezuma II is even quoted as asking for “those who know how to command snakes, scorpions, and spiders… be sent to bewitch the strangers”, when calling on Malinalco to help resist the incursion of Cortes and his armies. These are the legendary supernatural powers that Malinalxochitl had used when fighting alongside Huitzilopochtli and demonstrates that the legends surrounding Malinalco were believed, even by the most powerful and informed members of the Aztec elite. The unity between the Aztec bureaucracy and Malinalco is still evident today amongst the ruins of Cuauhtinchan, high upon the Hill of Idols. According to the codex Aubin, Emperor Ahuitzotl despatched a team of stone masons to Malinalco in 1501AD and this was presumably to begin work on Cuauhtinchan. It is also recorded that Moctezuma II extended the commission in 1515AD, suggesting that the work had proved to be more complicated than expected. The continued support of successive Emperor’s demonstrates that the work at Cuauhtinchan was of such importance to the Empire that it was worth 20 years of effort and finances attempting to chisel the complex out of the hillside. 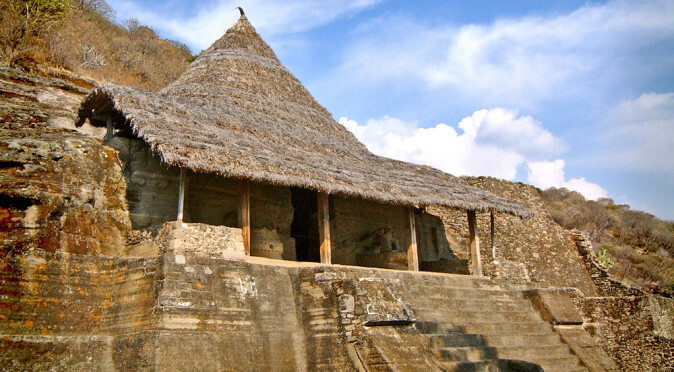 Cuauhtinchan consists of just 11 structures, but the majority of effort was expended on Structure I, the Cuauhcalli (House of Eagles), which was hewn directly into the hillside. The Cuauhcalli is the only known monolithic temple to be built by the Aztec and there must have been a special reason for them to attempt this complicated style of construction. It is possible that the entire complex was intended to be built in the same manner, but with the work taking far longer than expected the builders had to resort to artificially flattening parts of the hill and forming terraces on which they could build more conventional temple structures. Incredibly, after 20 years they had still failed to complete the work, with Structures VII and VIII being no more than foundations, at which point the Spanish arrived and work was stopped. 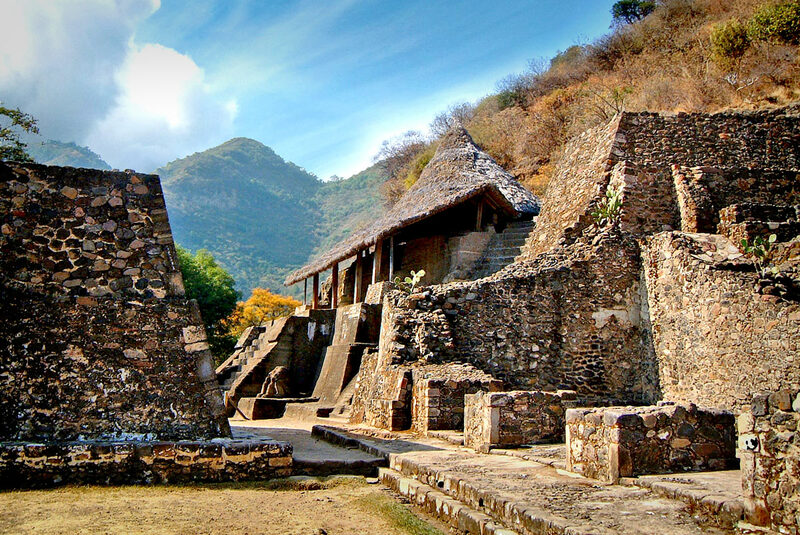 The Hill of IdolsThe final chapter in Malinalco’s pre-Hispanic history is recorded by Hernan Cortes. In 1521AD, Malinalco warriors made a failed attempt to capture Tlahuica (now known as Cuernavaca) which had become allied with the Spanish. Following a plea from Tlahuica to their Spanish counterparts, Cortes sent Andrés de Tapía to lead an attack on Malinalco. However, the Spanish army could only manage to force them into retreating up the Hill of Idols, which was too steep and dangerous for the Spanish cavalry to attack. Cortes records that “within the city at the top of the peak, there were many springs of excellent water producing a very fertile vegetation” and that trying to lay siege to the retreating Malinalca was futile. Instead, they elected to raze the town, leaving Malinalco ruined and all but defeated. Within 20 years work had begun on the enormous Monastery of the Divino Salvador which, along with Malinalco’s other Christian churches and chapels, was built by dismantling the ancient town of Malinalco and its temples. The archaeological complex of Cuauhtinchan was discovered in 1933 and was first excavated by José Garía Payón in 1935. Mural paintings of marching soldiers discovered in Structure III, the eagle and jaguar pelt effigies carved inside Structure I and the jaguar statues that flank its stairs led Payón to deduce that the complex was dedicated to the famous Aztec Eagle Jaguar Warriors. Eagle Jaguar Warriors were the Aztec elite soldiers and to be promoted to this rank they had to capture a certain number of sacrificial slaves for the Empire (thought to be 20). The slaves’ hearts were required to feed the sun, which was represented by the eagle – hence they became Eagle Warriors. Payón’s belief was that the complex at Cuauhtinchan was designed as a sanctuary where the initiation rites for Eagle Warriors could take place and this is still the predominant theory for why the Aztec wished to build the site. 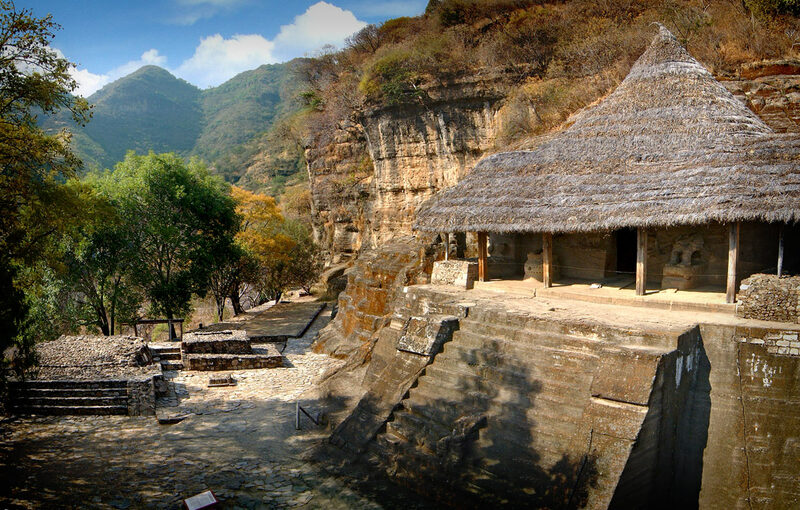 Today, there are many theories as to why the Aztec wanted to expend large resources on such an unusual complex at Malinalco and what the purpose of the temple structures of Cuauhtinchan were. The centrepiece was undoubtedly Structure I, the Cuauhcalli (House of Eagles), which was hewn directly into the cliff face at great expense and is the only example of a monolithic temple built by the Aztec – an act that alone signifies its importance. Payon’s original theory still remains strong, but other theories are starting to gain credence. W0132: Eagle and Jaguar Pelt inside the Cuauhcalli The syncretism between the eagle and the sun supports the best of these alternative theories, and that is that Malinalco may have been dedicated to the sun, with the south facing doorway of Structure I being prime for use as a solstitial clock. On the winter solstice the sun is at it lowest in the sky and can therefore beam through lower entrances and cast longer shadows than any other day of the year. The eagle in the centre of Structure I could be a marker stone and if the now crumbled doorway had been built to a precise height, then direct sunlight may have been restricted from shining on the central eagle on every day apart from the winter solstice. One can image that the declination of the sun was symbolic of it growing weak and needing feeding and by placing hearts in the dish-like back of the central eagle the sun could reach in and feed on them on the solstice. The east and west eagles, which are located on the bench either side of the central eagle, could have served a similar role using “zenith tubes” built into the roof which would only allow a piercing shaft of direct sunlight to shine into their receptacles on specific day of the year. Hilltop locations allowed priests to observe the horizon, which was largely impossible elsewhere because because of the hilly terrain or jungle canopy, and therefore hills became places of hallowed wisdom. The idea that Cuauhtinchan was built for the purpose of celestial observation is supported by the eastern facing Structure IV, which appears to have markers to view the sunrise. W0119NF: Nopal FruitThe sacrificial hearts themselves were called cuauhnochtli, meaning “cactus fruit of the eagle”, which relates back to the cactus that sprouted from the heart of Malinalxochitl’s son, Copil. 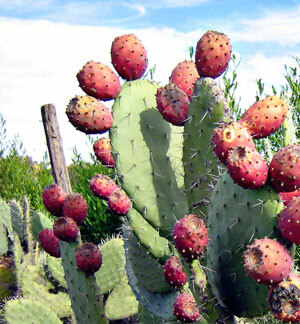 The common nopal cactus of Mexico features fruit that look like hearts and the vision of the eagle sat upon the cactus would have undoubtedly built the belief that eagles, and therefore the sun, ate hearts (the nopal fruit can be seen in fig. W0119NF and in the coat of arms in fig. W0119CA). It could have seemed sensible to the Aztec that the sun would prefer to gorge on hearts at Malinalco because of its relationship with Copil and his maligned mother. So the Cuauhcalli may have been built as a place to feed the sun the sacrificial hearts, but this iconography may also have been symbolic of the Eagle Warrior’s rites of passage. However, it seems certain that the temple wasn’t solely dedicated to the eagle or the sun, because behind the central eagle is a large circular hole that was carved into the temple floor. This was almost certainly intended for blood sacrifices to be drained into for the earth-monster, Tlaltecuhtli. The earth, like the sun, had to be fed to keep it fertile and to prevent it from getting angry. Tlaltecuhtli was a crocodilian creature who was torn in two by Quetzalcoatl and Tezcatlipoca to create the world of the Fifth Sun, with one half thrown into the sky and the other half becoming the earth. Tlaltecuhtli is normally depicted with a wide reptilian mouth and viscous fangs. 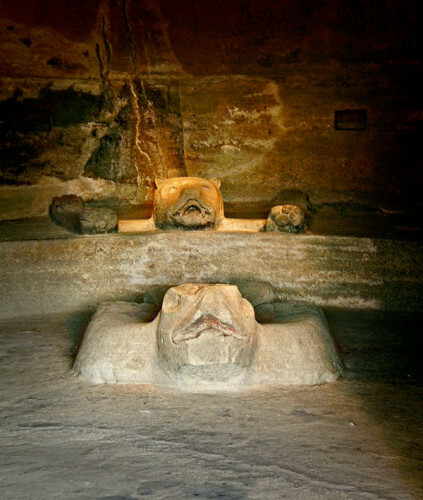 The doorway of the Cuauhcalli (Structure I) is carved to resemble a gaping reptilian mouth, with a bifurcated tongue flopping out as a doorstep, which is most likely to signify that this was a place where Tlaltecuhtli could be fed. 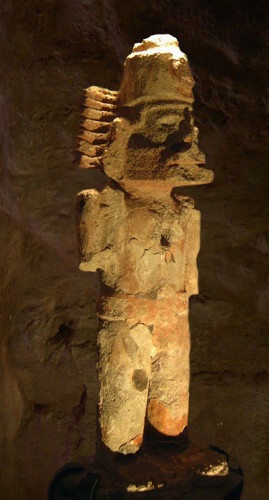 Ehecatl-Quetzalcoatl StatueThis myth also taps into other symbolism found around the Cauahcalli and Cuauhtinchan. The round temples are often associated with the God of Wind, Ehecatl-Quetzalcoatl. Quetzalcoatl (meaning “Feathered Serpent”) is obviously related to the serpent and to the east of the entrance to the Cuauhcalli is an image of a man sitting or riding upon a serpent. To the west of the entrance is the scant remains of an unknown effigy, but Tezcatlipoca is known to have been representative of the west and to be pictured in the form of a jaguar. The jaguar attire and pelts that are associated with kingship were representative of Tezcatlipoca, and a carved jaguar pelt is found inside the Cuauhcalli. In some myths, Quetzalcoatl, Tezcatlipoca, Huitzilopochtli and Xipe Totec represented the cardinal points and the creators of the universe. Xipe Totec was the god of rebirth and rejuvenation who flayed himself in order to feed humanity in an act that is thought to be associated with the maize seed shedding its outer layer before germination and/or the snakes ability to shed its skin which was perceived to be an act of rebirth. In the Aztec calender, Xipe Totec was the guardian of the day Cuauhtli, which translates to the eagles day. A vase featuring Xipe Totec was found amongst the pre-Aztec discoveries. The symbolism of Cuauhtinchan goes far beyond those of the Eagle Jaguar Warriors. 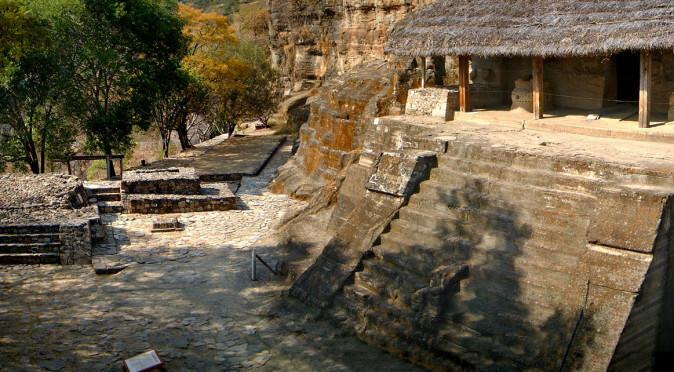 The Cuauhcalli has 13 steps leading up to the temple enclosure and this number is normally reserved for the palace-temples of the Emperor and another theory exists that suggests this was a temple for the Emperor and that the carved Jaguar pelt is where he would have sat. The two eagles carved into the bench either side of the temple could then have been seats for high priests with the central eagle designed as an altar dish for offerings or burnings that could reveal visions. Therefore, the temple may have been designed for Emperor to receive prophesies from the priests of Malinalco – as Moctezuma II was reported to have done. 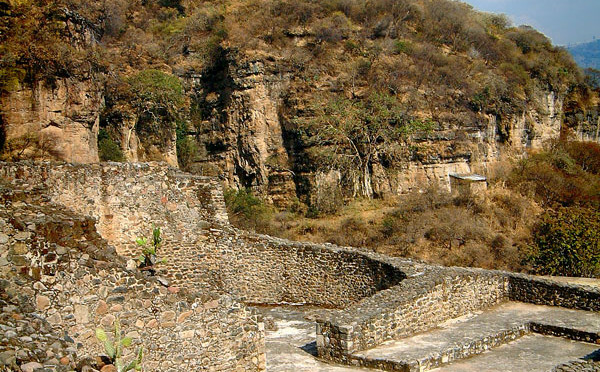 There will probably never be a definitive answer for why Cuauhtinchan was built or what purpose it served, but the myths that surround Malinalco certainly suggest it was a source of powerful rulers with supernatural powers, and this would have certainly attracted the attention of the Aztec Emperor as he set about expanding the empire and defending its acquisitions. Whether Cuauhtinchan was used a religious retreat for initiating elite warriors into the Eagle Jaguar ranks, used by Emperor’s to receive powerful prophesies, or was simply a religious complex built on a sacred hill, is uncertain, but it was certainly a very important place. Malinalco is home to one of the wonders of the Aztec world, the site of Cuauhtinchan, which is propped precariously on a steep hillside, 125m above the town. The stunning Cuauhcalli is the only known monolithic temple built by the Aztec and was carved into the hillside 125m above the town of Malinalco entirely in one piece. 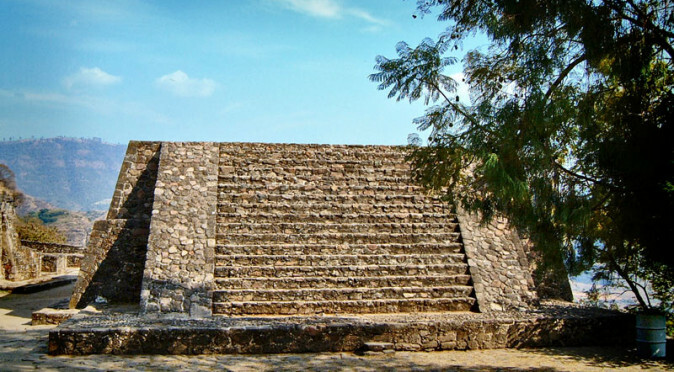 Structure II is an archetypal Mesoamerican pyramidal platform, which creates an unusually small plaza on the side of the Cerros de los Idolos. Structure III is similar to Structure I in its floor-plan, but was ritually built on top of an older structure rather than carved out of the rock face.